Beauty Costs > How Much Does a Prom Dress Alteration Cost? How Much Does a Prom Dress Alteration Cost? While shopping for a prom dress can be very exciting, finding the one that is perfect for you can be tough. The bad part about most prom dresses is that many of them will not fit properly when bought from a local store. Thankfully for alterations, though, a professional will be able to take measurements and create the perfect fitting dress. The cost of a prom dress alteration will depend on the type of dress, the amount of work that needs to be done, the company/professional doing it and geographical location. 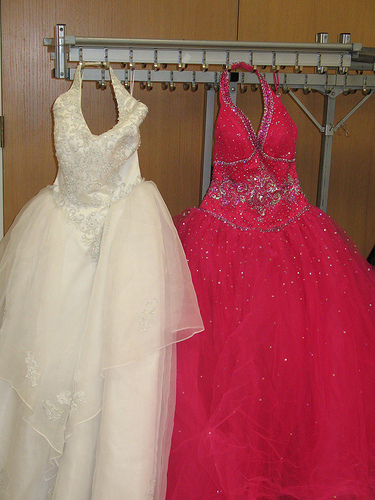 Most prom dress alterations will cost anywhere from as little as $5 to as much as $95. Most of the time, it is best to budget $30 to $65 but no more than $100. For example, a hem, which can be either done high or low, can cost $20 to $40 per layer. “Per layer” refers to the layers of fabric, such as the dress itself and a later of tulle on top of it. If a train has to be shortened or lengthened, this can cost anywhere $5 to $20. If the dress has to be let out rather than taken in, this can cost $20 to $30. Adding on to the length of the dress can cost $20 to $55. Shoulders or sleeves that have to be adjusted can cost $15 to $35, depending on whether or not the dress has sleeves. If the dress is strapless and you need straps to be added, the cost can be $10 to $20 depending on the material and width of the straps. If a small hook has to be added to keep the train up while dancing, this can cost $5 to $10 to add the piece. Complex alterations, such as bringing the dress down two to three sizes, can cost $40 to $90. A few members on this MerchantCircle.com forum thread claimed that you should be prepared to spend around $25 to $70 for basic alterations. Most seamstresses will be able to bring a dress down a few sizes; however, if you need it to come down more than three sizes, the job may not be able to be done without heavily altering the appearance and shape of the dress itself. Bridal shops, private, and family seamstresses are all places to consider getting an alteration done. When the seamstress is finished, the dress should look as though it were brand new. You should not be able to tell what alterations were done or where they were done, and the hems and seams, even when examined up close, should be flawless. If they are not or if the dress starts to come apart or fray, there should be some type of guarantee that the seamstress will fix it for free. When getting alterations, the seamstress will have you try on the dress in front of a mirror. She will then make adjustments and hold them in place using pins so that you can see exactly what the dress will look like when it is finished. If you are not satisfied with the final product, you may be able to get your money back. A train that has to be held up will need a piece of jewelry on the back, which is usually put near the calves. This piece is usually a small fancy pearl; however, those who want something fancier may have to pay more for the piece. Dresses that are complex and filled with decorations, such as sequins and beads, may cost more than a plain dress. The same can be said for dresses that have more than one layer. Plan on spending around $10 to $15 per layer. A shawl that is added to a dress will be an additional charge on top of the alteration. Rush charges can add an additional $20 to $40 to the job. If the dress needs a zipper repaired or put in, this will cost from $15 to $30. Rush jobs may be charged up to 50% more than the average job. If you want delivery of the dress or for the seamstress to come to you for measuring, you will have to pay extra for travel. If you do not know where to look for an alteration company, consider looking for a “tailor” online. When choosing one, however, always make sure that you see a sample of his work. An inexperienced tailor can ruin your dress. Most dresses are designed for those under 5’9″. Someone who is under 5’9″ will often have to get a hem performed. When purchasing a prom dress online, always make accurate measurements ahead of time to ensure that the dress is going to fit. It is always best to measure too big than too small. Purchasing a dress that is a size too big or a few inches too long will be much easier and cheaper to fix than letting a dress out or lengthening it. Most companies will ask that you bring in your dress at least four to five weeks before an event. Ask the company where you purchased the prom dress from. Many companies are able to perform the job at a discount or even for free. If you do not mind haggling, consider trying to throw the dress alteration in with your prom dress price. Whew! Feels pricey…but the dress had 2 layers of the the hem that needed shortened plus a train that was also shortened. She also added padding to the bust area since it needed a bra insert, and she’s dry cleaning it for us. It fits great and looks beautiful. The price kinda hurts, but I’d be more sad if my daughter’s dress was ruined by someone less skilled.